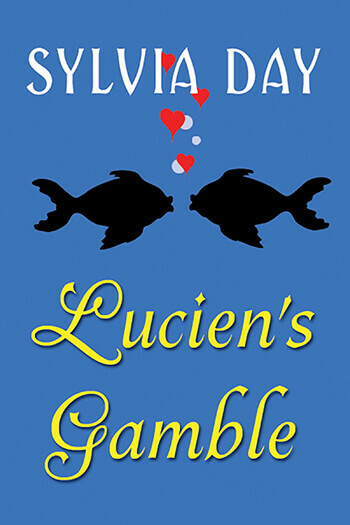 Lucien Remington’s reputation as a debauched libertine who plays by no one’s rules–in business or the bedroom–is well deserved. He gets what he wants, social repudiation be damned. But society can keep from him the one thing he truly desires, the untouchable Lady Julienne La Coeur. Julienne looked across the massive mahogany desk into blue eyes the color of which she’d never seen before. Somewhere between deep blue and purple, they were fringed with thick black lashes that were shamefully wasted on a man. “I need to find my brother, ” she said, lifting her chin in defiance. “Lady. Julienne. And I attempted to leave messages. I have yet to receive a response.” She shifted in her chair as the broadcloth trousers chafed the delicate skin of her derriere. The wig itched, too, but she refused to embarrass herself further by scratching. Julienne resisted the urge to flee as Lucien Remington rose from behind the desk and rounded it. She licked suddenly dry lips as she took in his height and the breadth of his shoulders. He was even more devastating up close than he had been across crowded ballrooms. Black hair and tanned skin displayed his extraordinary eyes to perfection. A strong jaw and generous mouth bespoke of his sensual nature, which was lauded far and wide by well-pleasured ladies of his acquaintance. “Exactly, Lady Julienne. A gentleman’s club. Those garments do not disguise the fact that you are all woman. Ridgely’s foxed, or insane, not to have noticed.” His perusal paused briefly on her breasts before rising to meet her gaze. “No one noticed,” she muttered. And so he had. Almost immediately. She’d been in the club only five minutes at most before he’d grabbed her by the elbow and pulled her in his office. But then, it had only taken her five minutes to make a mess of the whole affair. As he leaned against his desk directly in front of her, the material of his trousers stretched over firmly muscled thighs. He was so close she could feel the heat emanating from his body. She smelled a hint of tobacco and starched linen, and another delicious scent that could only be the man himself. Remington cleared his throat, drawing her attention. Julienne flushed at the knowing smile that curved his lips. Julienne’s gaze was riveted to his lips. If she leaned forward just a tiny bit, she could touch them with her own. Would they feel as soft as they looked? He pulled away, then lowered to his haunches and placed his large hands on her knees. She jumped at the heat that burned through the broadcloth. “Who is your brother?” he asked. Julienne’s mouth parched the instant he touched her, making speech difficult. Lucien Remington was simply gorgeous. She’d always thought so, always compared her suitors to him and found them lacking in all respects. No one was as handsome, or as interesting, or as…wicked. Her tongue flicked out to wet her bottom lip, and his eyes followed the movement. An ache came to the place between her legs. Julienne attempted to push his hands away, but when she touched his skin, her palms burned. She pulled away quickly. “A gentleman does not put his hands on a lady,” she scolded. And he wasn’t, she knew. His determination and ruthless business acumen were the stuff of legend. If it wasn’t precisely prohibited in writing, Lucien Remington would do it. He showed no leniency when it came to expanding his empire. He was widely disparaged for his “vulgar pursuit of money”, but Julienne found it rather thrilling. He cared nothing for the regard of others, a nonchalance she wished she could affect herself. She said nothing, but she clenched her fists. Their situation must be worse than she’d thought. It was common for Hugh to carouse and spend days on end with his scapegrace associates. From experience she knew he most likely wasn’t in danger. But that didn’t ease her worry. Or their predicament. “No, you shouldn’t have,” he agreed, his voice soft. Remington rose at the same time, towering over her. The top of her head barely reached his shoulders and Julienne was forced to tilt her head back to look at him. She turned to leave, but his grip on her elbow stayed her. Heat radiated from his fingers and spread through her body. She didn’t, not truly, but she must. Remington’s proximity was doing terrible things to her. Wonderful, terrible things. Things it most likely did to countless other women. Remington laughed. The deep, rich sound gathered around her like an embrace and made her shiver. But she wasn’t cold. To her dismay, she was growing hotter by the moment. She couldn’t help it with the way he looked at her… Julienne had seen that look before. But no man had ever dared to give it to her. She found she rather liked it. “I’ll leave immediately,” she offered. “My aunt will worry,” she argued. “I know everything about every one of the members of my club. Especially those who enjoy lines of credit.” Remington’s thumb began an absentminded caress of the hollow of her elbow. Julienne felt the warmth of his touch all the way to her bones. She looked away, flustered that he knew such intimate details. “Do you also know how sick to death I am of that chore?” she said finally, surprising herself with the admission. Julienne looked up at him, overwhelmed by his nearness. She felt slightly tipsy, but she couldn’t blame it on the brandy. Lord Ridgely was presently wearing most of it. 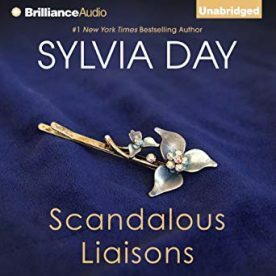 Anthology: Lucien’s Gamble is also available as a part of Scandalous Liaisons. Lucien’s Gamble is loosely connected to Sylvia’s other stories: Catching Caroline and Mischief and the Marquess (which is her novella featured in Perfect Kisses).